Jan van Eyck was a Flemish painter who was one of the leading artists in Early Northern Renaissance art. 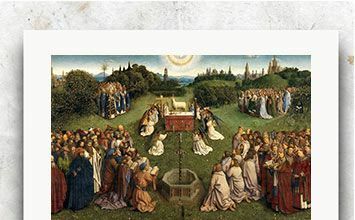 Credited as one of the first artists to use oil paints in his works, Van Eyck has created some of the most enduring masterpieces of the Northern Renaissance period, including the Ghent Altarpiece. Hieronymus Bosch was a Dutch painter during the Northern Renaissance that painted real and imaginary figures in vast landscapes that demonstrated allegories, narratives and morality lessons. Albrecht Dürer was a German painter and printmaker whose introduction of classical motifs whose iconic works secured his reputation as one of the most important figures of the Northern Renaissance. Pieter Bruegel the Elder was one of the most important Flemish Renaissance painters who was a key influence on the Dutch Golden Age of painting. His works diverged from the tradition of religious scenes and portraits, and instead depicted landscapes and peasant scenes.